The lining of our nose has lots of tiny blood vessels that are necessary to help humidify the air we breathe. Nosebleeds happen because these vessels are extremely fragile and can bleed easily. 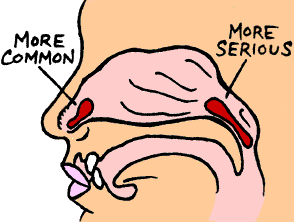 Also, the air moving through our nose can dry and irritate it’s membranes, forming crusts. These crusts bleed when irritated by rubbing, picking, or blowing the nose. Epistaxis or nosebleeds are a common occurrence. Most of them are not serious, but can be an inconvenience. They can affect everyone, but are far more common in children between 2-10 and adults between 50-80 years. A nosebleed comes either from the front of your nose (anterior) or the back of it (posterior). 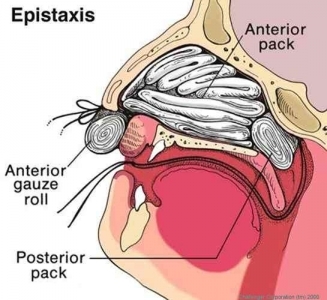 Anterior nosebleeds: Most of these start in the lower part of the nasal septum (the wall separating your nostrils) in the kiesselbachs plexus commonly known as Little’s area, and are usually caused from a break in the fragile blood supply. Blood oozes out from the nostrils. Posterior nosebleeds: These are the rarer type. They start deeper in the back of your nose and cause the blood to drop down your throat. They are more likely to happen in older people, those with high blood pressure, or those who’ve had a facial injury. It can be hard to tell if you have a posterior or anterior nosebleed. Both can make blood flow towards the back of your throat if you’re lying on your back. Blood oozing from an anterior nosebleed is generally bright red while it may be dark or bright red if from a posterior nosebleed (commonly mistaken for hemoptysis due to expectoration). Posterior nosebleeds can be much more serious. They do not arrest with 10-15 minutes of home treatment. If severe bleeding occurs with signs of shock, you must visit a hospital immediately. Associated symptoms depend upon on the severity of bleeding. 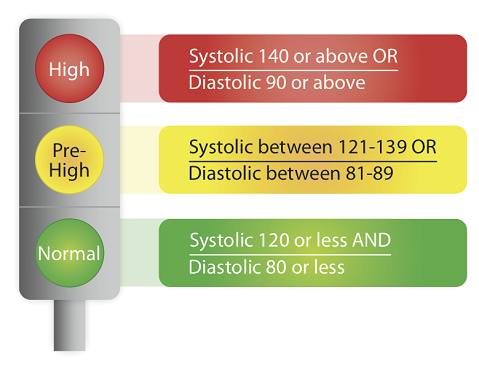 Moderate blood loss may produce light-headedness, dizziness, and slight respiratory difficulty; severe hemorrhage cause a sudden drop in your blood pressure (hypotension), with a rapid and bounding pulse, difficulty in breathing, and pallor. Nosebleeds are generally unilateral, except when they’re due to a dyscrasia or severe trauma. In severe cases, blood may seep behind the nasal septum; it may also appear in the middle ear or in the corners of the eyes. Under such circumstances, you’ll need to resort to emergency help. Foreign body in the nose. This is more common in children, who may put things up their noses, but may be found in adults, especially after an automobile accident, when a piece of glass may have entered the nose. 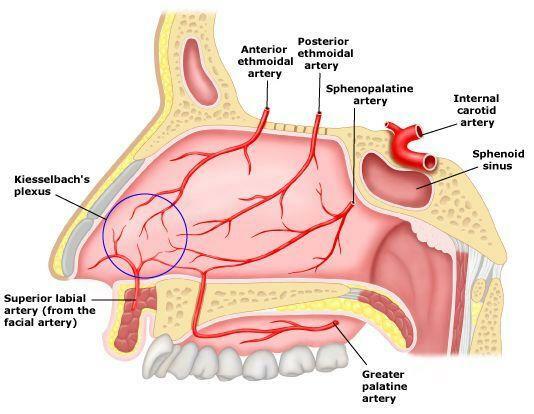 Abnormal blood vessels in the nose, such as with Osler-Weber-Rendu syndrome, also called hereditary hemorrhagic telangiectasis(HHT). This rare condition affecting the blood vessels is caused by genes passed down in families. You might wake up at night with your pillow soaked in blood. The abnormal blood vessels make it hard to control this kind of nosebleed. Blood thinners, such as aspirin, warfarin, enoxaparin, or nonsteroidal anti-inflammatory drugs (NSAIDs). To understand the cause in your case you must see a doctor for a systemic evaluation. Your doctor may inquire from you a thorough medical history for previous bleeding, high blood pressure, liver diseases, use of anticoagulants, nasal trauma, family history of bleeding etc. to identify the cause. He or she may suggest an analysis of your blood coagulation parameters. Measurement of your blood pressure and X-rays of the skull and sinuses maybe necessary. Stay calm. If you start to get nervous, it can actually make you bleed more so try to relax. Tip your head a bit forward. This keeps the blood from draining down the back of your throat. Swallowed blood can irritate your stomach and cause vomiting. Vomiting may make the bleeding worse or cause it to start again. Spit out any blood that gathers in your mouth and throat rather than swallowing it. Pinch your nostrils close. Use your thumb and index finger to hold your nostrils (the soft cartilagenous part of your nose) shut for 5 to 10 minutes while you breathe through your mouth. This puts direct pressure on the bleeding blood vessels, causing the blood to stop flowing. Spraying the nose with a medicated nasal spray (Afrin Vicks Sinex or Mucinex) before applying pressure may help stop a nosebleed faster. Apply an ice pack over the bridge of your nose and cheeks. Cold will constrict the blood vessels to help stop the bleeding. Keep pinching for a full 10 minutes. Use a clock to time the 10 minutes as it can seem like a long time. Resist the urge to peek after every few minutes to see if your nose has stopped bleeding. Check to see if your nose is still bleeding after 10 minutes. If it is, blow gently to get rid of any blood clots and hold it for another 10 minutes. Most nosebleeds will stop after 10 to 20 minutes of direct pressure. Put a thin layer of a saline or water-based nasal gel, such as NasoGel, or an antiseptic nasal cream inside your nose. Do not blow your nose or put anything else inside your nose for at least 12 hours after the bleeding has stopped. For more severe nosebleeds, other treatments may be required. Sometimes the nose may be packed with gauze to help stop the bleeding. This might need to be in for a few days. The packing may dissolve by itself, or you may need to have it removed by your doctor. Often, antibiotics will be given or applied to the packing itself to reduce the chances of serious infectious complications. Ointments or sprays containing vasoconstriction agents may also be used. These cause the blood vessels to contract and help stop the flow of blood. If nosebleeds are persistent, cautery may be required. 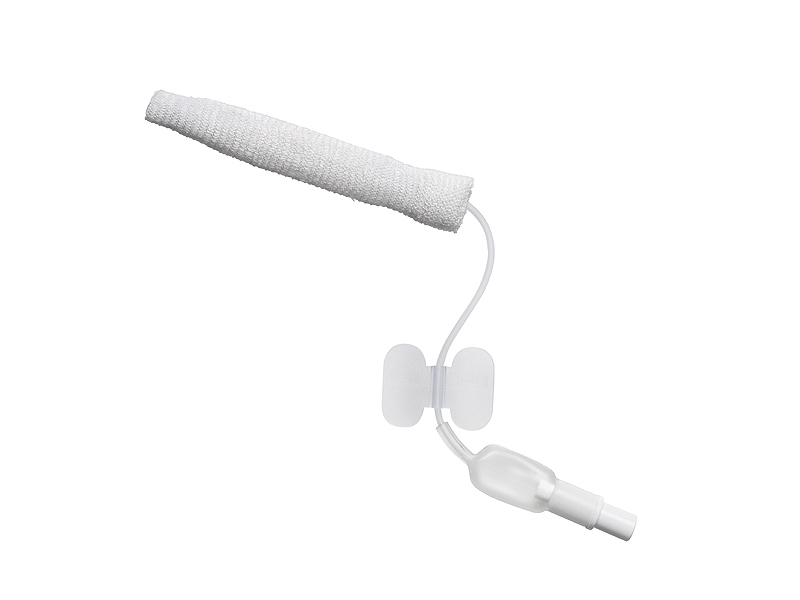 Cautery uses heat or cold to seal the wall of the blood vessels so that they are less likely to rupture and cause persistent nose bleeds. Cautery is not recommended for young children, as they may not keep still long enough to have the treatment. Keep the inside of your nose moist. Dryness can cause nosebleeds. Use a cotton swab to gently smear a very thin layer of Aloe Vera/ Saline nasal gel in your nostrils three times a day, including before you go to sleep. 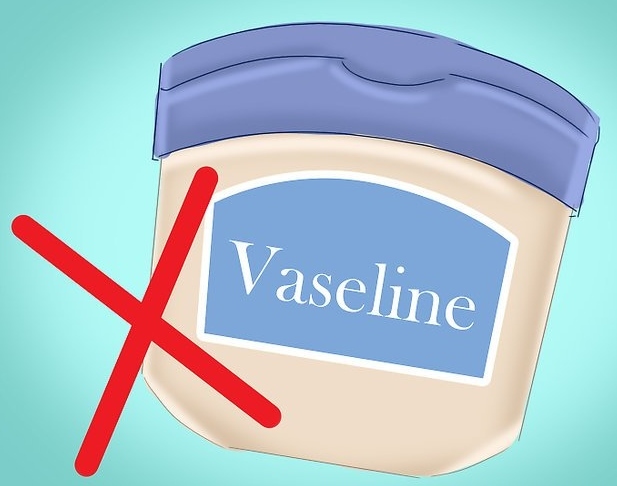 Do not apply Vaseline, mineral oil, or other fat-based products (like coconut oil) to the inside of your nose. If you inhale small amounts of it into your lungs it can cause lipoid pneumonia (a specific form of lung inflammation that develops when fats/ lipids enter the bronchial tree). The aim of homoeopathy is not only to treat the nosebleed but also to address its underlying cause and check individual susceptibility. Therapeutically, several remedies like Agaricus muscsarius, Phosphorus, Ammonium carb, Arnica, Cactus, Calcarea carb, China, Crocus, Crotolus H., Erigeron, Ferrum phos, Glonoinum, Hamamelis, Thlaspi bursa etc. are available to manage the bleeding. They can be selected on the basis of cause, sensations and modalities of the complaints. The deep acting miasmatic and constitutional medicines help check the root cause to bring about a lasting cure. During the early years of my practice, I happened to be associated with Archers and Cyclists of the Indian National teams. Many of the cyclists and a lot many of the archers admitted suffering from epistaxis. The causation in each of them was different. It was quite incapacitating for some as it was a hinderant in their performance, consequently affecting their ranks. 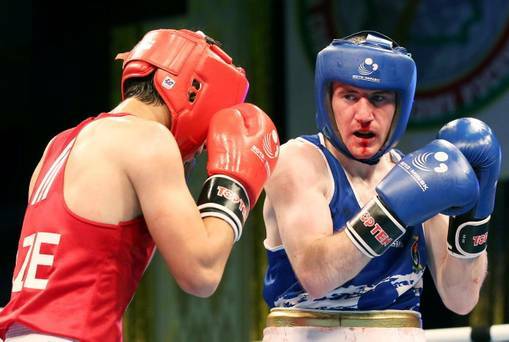 Especially the archers, complained of losing their focus as an after affect of a nosebleed. Just a few doses of the carefully selected medicines based on their causation and individual susceptibility was enough to make them symptom free for long! In extreme summer and winters, we as homoeopathic physicians come across innumerable cases of children with bloody nose. Trust me, they’ve never been disappointed! For individualized remedy selection and treatment, consult your homoeopathic doctor in person.